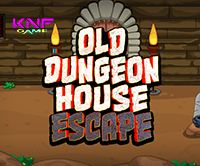 KnfGame - Knf Old Dungeon House Escape is another point and click room escape game developed by Knf Game. After a very hard day of work you fell so tired and felt asleep in your office. Suddenly, when you woke you was shocked, because you are in some strange place. Then you came to know that you are trapped inside an old dungeon house. Now you have to find the mysterious hidden objects around the house and solve some puzzles and escape from the dungeon house and get back to home quickly. Good luck and have fun! I have an axe called 'clue paper'. got out without all puzzles done by using axe (clue paper) on wall in second new room. sloppy. Watch the yellow grid. In place of the points put the pentagon on all brands ! Still have shovel in inventory - do we use it a second time? Haha - after all that all we needed was an axe to hack through the wall and escape! Please someone could make the colors ? ok...the third try was good with the tube puzzle, I got the stonehead!!!! How do you activate the pipe puzzle?